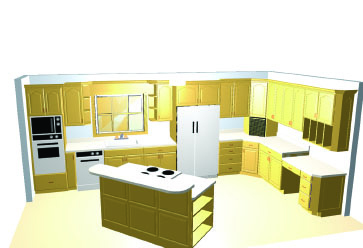 C&D Cabinet uses Case Planner, a simple-to-use, entry-level room and cabinet design- to-manufacturing software package for custom residential cabinetry. It is the ideal solution for the smaller custom cabinet manufacturer interested in seeing the benefits of automating their business. Case Planner offers the essential tools required by the cabinet manufacturer to create clear professional drawings, proposals, and contracts for the customer, as well as shop drawings, material requirements, cutlists, and assembly sheets for the shop floor. 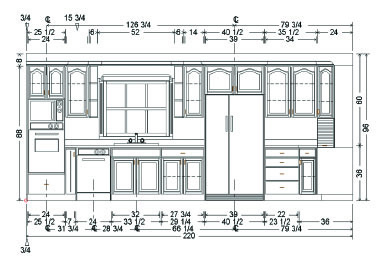 Every aspect of cabinet design is done and modified using a simple point-and- click of the mouse; from overall cabinet and part sizes, section opening sizes and configurations. Radius or clipped corners, all size aspects as well as section configurations are quick and easy. Door, drawer and all shelving arrangements are easily modified. Decorations such as rosettes and fluting, as well as shaped valances, can be assigned. All changes are instantly reflected in the parts list, and labor and material reports. Comprehensive countertop drawings are created automatically during the design of a room. Tools are provided for modifying, adding, or deleting tops. Easily add sink cutouts, joints, splashes, and edge types. Changing any item immediately updates the associated pricing and graphics. 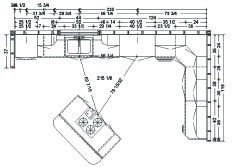 Floor plan, elevation, and perspective views can be generated from the customer's field measurements and requests. Various appliances, passage doors, windows, moldings, and wallpapers can be created and displayed. 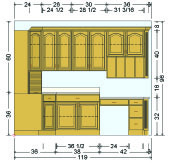 Selecting cabinet doors, drawer and paneling details, and colors, is also easily accomplished. Multiple windows can be displayed and any modifications made in one window immediately update the other windows. For example, changing the size or shape of a base cabinet is immediately viewable on the countertop and perspective views. Quickly and easily create dimensioned shop drawings, detailed cutting lists for all components, cost proposals, contracts, and material and hardware lists for your clients. Custom cabinets can be selected from a list and priced or produced without having to do a complete room design. All modifications can be accomplished in a full graphical view. This saves time when needing to build just a few cabinets or when presented with a list from a client.